Bill Inmon, the father of the data warehouse concept, has written 40 books on data management, data warehouse, design review, and management of data processing. Bill has had his books translated into Russian, German, French, Japanese, Portuguese, Chinese, Korean, and Dutch. Bill has published more than 250 articles in many trade journals. Bill founded and took public Prism Solutions. His latest company — Pine Cone Systems — builds software for the management of the data warehouse/data mart environment. Bill holds two software patents. Articles, white papers, presentations, and much more material can be found on his Web site, www.billinmon.com. Chapter 1: Evolution of Decision Support Systems. Chapter 2: The Data Warehouse Environment. Chapter 3: The Data Warehouse and Design. Chapter 4: Granularity in the Data Warehouse. Chapter 5: The Data Warehouse and Technology. Chapter 6: The Distributed Data Warehouse. Chapter 7: Executive Information Systems and the Data Warehouse. Chapter 8: External Data and the Data Warehouse. Chapter 9: Migration to the Architected Environment. Chapter 10: The Data Warehouse and the Web. Chapter 11: Unstructured Data and the Data Warehouse. Chapter 12: The Really Large Data Warehouse. Chapter 13: The Relational and the Multidimensional Models as a Basis for Database Design. Chapter 14: Data Warehouse Advanced Topics. Chapter 15: Cost-Justification and Return on Investment for a Data Warehouse. Chapter 16: The Data Warehouse and the ODS. Chapter 17: Corporate Information Compliance and Data Warehousing. Chapter 18: The End-User Community. Chapter 19: Data Warehouse Design Review Checklist. The new edition covers new approaches and technologies, many of which have been pioneered by Inmon himself. Methods for data warehouse design. Technologies for loading, indexing, and managing data. Data warehousing and ERP systems. 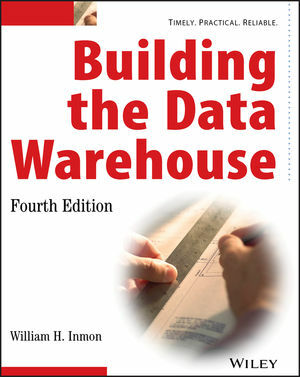 Building the Data Warehouse has sold nearly 40,000 copies in its first 3 editions. Inmon is widely recognized as the "Father of the Data Warehouse" and remains one of the two leading authorities in the industry he helped to invent.